The fire broke out around 11 p.m. Friday night. 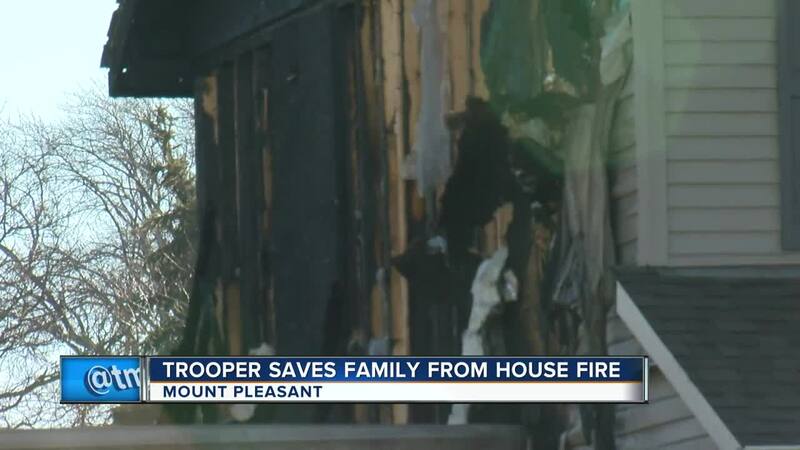 MOUNT PLEASANT -- An off-duty Wisconsin State Trooper is being credited for helping a Mount Pleasant family quickly escape a house fire. On Friday, just after 11 p.m., the Trooper noticed smoke in the air while driving. He then followed the smoke, located the fire, knocked on the door at a home and woke up everyone inside. Thankfully, everyone was able to escape without any injuries. Fire officials were able to contain the fire. Mount Pleasant Police say the fire started started on the outside of the home's garage near a wood pile. The roof of the garage collapsed and the two vehicles located inside were destroyed. There was extensive heat, water and smoke damage to the rest of the residence.